Mason City was presented with a 2019 Healthy Hometown Community Award during the Iowa Healthiest State Initiative awards ceremony held on Feb. 7, 2019. The award recognizes Mason City for its accomplishments in health improvement initiatives within the community. Fifty-one individuals and 11 worksites participated in the North Iowa Fresh Bounty Basket program that delivers local farm fresh produce along with recipes to participants. Water bottle filling stations were installed at all K-12 schools. Each student also received a reusable water bottle. A new community garden location was started and improvements have been made to an existing community garden. The improvements include re-roofing a garden shed, installing galvanized signage and water enhancements. "The Healthy Hometown community award celebrates the success achieved by Mason City," said Mary Lawyer, director of Community Health Improvement at Wellmark. "The work Mason City continues to do is remarkable, their commitment to the health and well-being of their residents is inspiring." "“The Healthiest State Initiative is proud to recognize the work Mason City has been doing to improve the overall health and well-being of Iowans,” said “They have set a great example for other individuals, communities, schools and workplaces to emulate. Jami Haberl, Healthiest State Initiative executive director. Beginning in 2018, Mason City will continue our journey to improve well-being as HEALTHY - Mason City" transitioning to Healthy HometownSM Powered by Wellmark. In May of 2012, Mason City was named one of the initial Blue Zones Project demonstration communities in Iowa receiving assistance from experts to develop and implement a blueprint for making permanent environmental, social and policy changes that transition people into healthier behaviors that can lead to longer, happier lives. They successfully achieved Blue Zones Community Certification in May 2014. Making the healthy choice can be difficult, but with the help of Healthy HometownSM Powered by Wellmark, communities like Mason City are equipped to create positive changes. Healthy Hometown, backed by the Healthiest State Initiative, assists communities in identifying the strengths and weaknesses of policies, programs and environments for promoting health and well-being. Through this initiative, we are provided with the tools and expertise to take action to make our hometown healthier and safer. School greenhouse built and integrated curriculum. Promote Farmers Market and locally grown and regionally grown foods. Established a bike share program. Established a worksite well-being collaboration with Chamber of Commerce. Mason City is transforming where we live, work and play, and making healthy choices easier. A healthy hometown is a thriving hometown with a high quality of life, local pride and a strong economy. Learn more about HEALTHY- Mason City by contacting us at: HealthyMasonCity@masoncity.net or calling 641-424-7180. True well-being includes all aspects of our lives, from community to social networks, habitat to inner self. By optimizing the environments where we spend our time, we can make the healthy choice the easy choice. Brought to Iowa through an innovative sponsorship by Wellmark in collaboration with Healthways and Blue Zones®, the Blue Zones Project® initiative encouraged all Iowa communities to change their built environments to make the healthy choice the easy choice. Knowing that a community designed for well-being makes the healthy choice easier, which leads to long term sustainability and that making Iowa a healthier state will benefit every citizen by making Iowa's economy stronger and our quality of life better and the same holds true for Mason City. 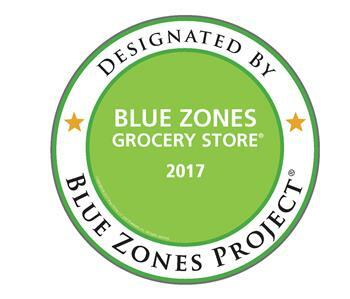 In May 2014, Mason City achieved key milestones and became a Blue Zones Community®. Since May 2012, community leaders, volunteers, and organizations throughout Mason City have made changes to community policy and have engaged citizens, worksites, restaurants, grocery stores, schools, and other community organizations to create a place where people can live longer, better lives. Mason City Community School District Administration Bldg.